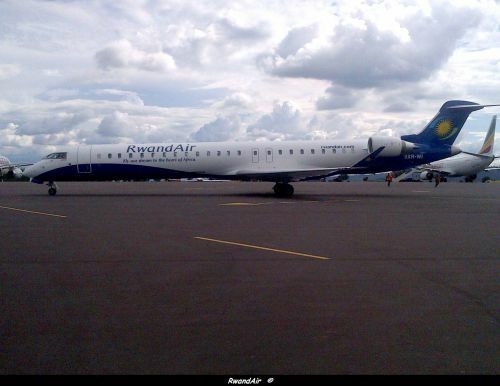 RwandAir taken delivery of its second CRJ-900NG, yesterday. 9XR-WI has joined its sistership 9XR-WH, which arrived two weeks ago. They will be used on the regional network, as well on news RwandAir's destinations, which will be Juba (South Sudan), Douala (Cameroon), Abidjan (Ivory Cost), Lusaka (Zambia) and Zanzibar (Tanzania). Futhermore, John Mirenge has unveiled, the new strategy for the airline. By 2017, RwandAir plans to operate a fleet of 17 aircraft, including the purchase of a pair B787 Dreamliner. RwandAir has just started talks with Boeing. They will fly to Europe, China and India. RwandAir hopes to become profitable by 2015-2016, and would ideally become a publicly listed company sometime around 2018-2020, at the Rwanda Stock Echange (RSE). Mirenge also said the biggest challenges for the airline included high fuel costs, outsourcing of maintenance and the relocation fees of its team of 60 largely expatriate pilots. RwandAir was created in December 2002 and began flights on April 2003 with a B737-500. The airline operates a fleet of 7 aircraft (two B737-800s, two B737-500s, two CRJ-900NGs and one Dash Q200) and serves 17 destinations in East, Central, Southern Africa and also in the UAE.